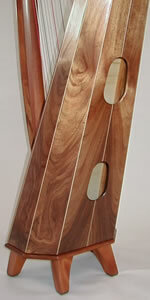 Koa wood is only available from Hawaii. 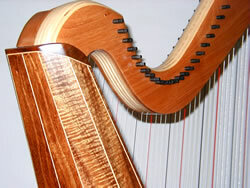 It is difficult to get, but well worth the effort as it is a wonderful instrument wood. Koa is harvested from plantations that are grown mostly on the island of Hawaii. 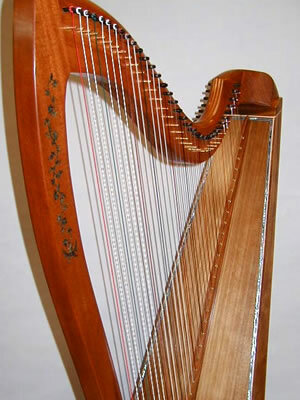 Koa wood adds $800 to the price of the harp. 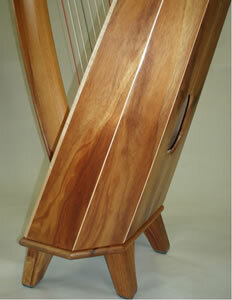 The Koa Cygnet with pearl inlay on the mahogany pillar and around the soundboard. 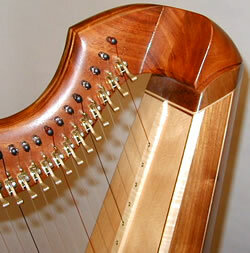 Notice the dark rosewood string rib. This is a close up of the neck resting on the soundbox and the contrasting trim around the spruce soundboard with a maple string rib. You can have the piano pin block stained to match the koa as in the photo on the left or left natural as in the photo on the right and below. It looks great either way. Here are photos of the contrasting trim around a light cedar soundboard and the unstained natural piano pin block neck. See the name plate in the photo on the left. It adds strength to the neck and pillar connection. These are some beautiful koa T-braces on the Swan. 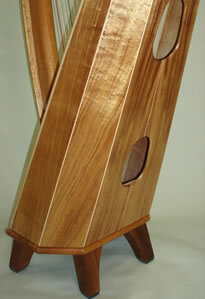 The koa wood can vary greatly in color and grain patterns. It makes it most interesting to work with. 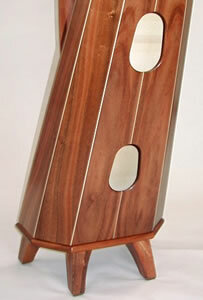 Koa has a very rich sound with clear bell-like tones especially in the high end. This makes it one of our favorite woods. Koa comes in a wide variety of grain patterns. Below is a sampling of some of them. The coloring can be a light amber to a dark brown. We just never know what we're going to find in a board. They're all beautiful! 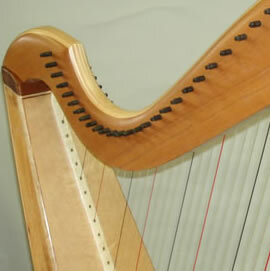 The rubber on the bottom of the feet helps to keep the harp from slipping when playing on an uncarpeted floor. The Koa Deluxe has pearl inlay around the soundboard and inlay down the pillar, folk gut strings and Camac levers. 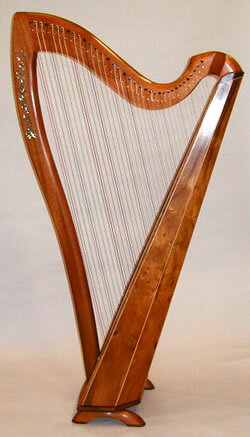 We use our choicest pieces of koa to build this harp and it is stunning! Also take a look at the Royal Hawaiian Deluxe. 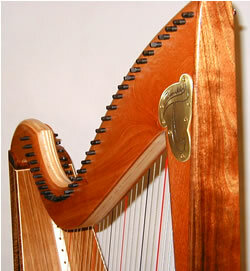 To see a closeup of the inlay on this harp, click here. 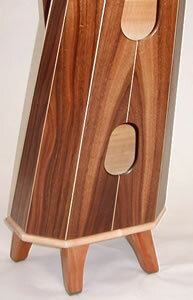 Also see more about inlay. Some of the Koa woods above might be considered deluxe and there would be an extra charge for it. If you're interested in premium Koa, let us know. We can show you what we have by way of a private webpage. There is a $100 minimum for looking that will be applied to the price of your wood choice.